An Englishman in Colombia: Little by Little! 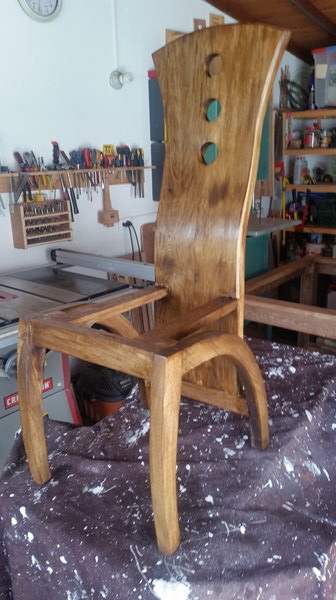 The is always a minute or two to get a bit done, so yesterday and this morning I added the second and third coat to one of the chairs, thinking about it, I thought that it would be better to get one done, and decide on the number of coats. One chair takes about 40 minutes a coat, which is better than getting nothing done. Compare that against a chair with only one coat! 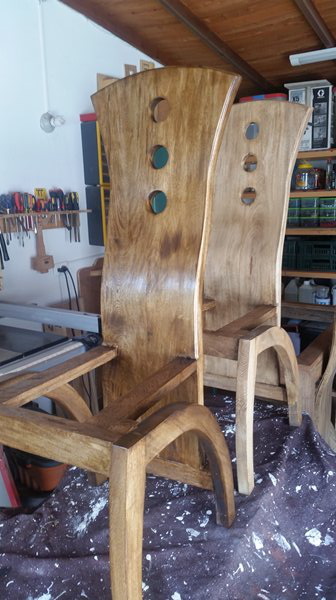 Having spoken with Marcela, I think that we are going to go with three coats, so now I will start on another chair. The dark patches on the finished chair, look like I haven't applied the stain/varnish correctly, but it is the grain pattern, up close and personal, it looks fine! I have yet to decide, but once they are all varnished, I may buy some cans of spray satin polyurethane, to give a bit more protection.